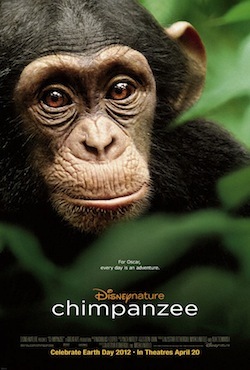 This morning at Downtown Disney West Side, the world premiere for Disneynature’s Chimpanzee took place at the AMC 24 Theaters. 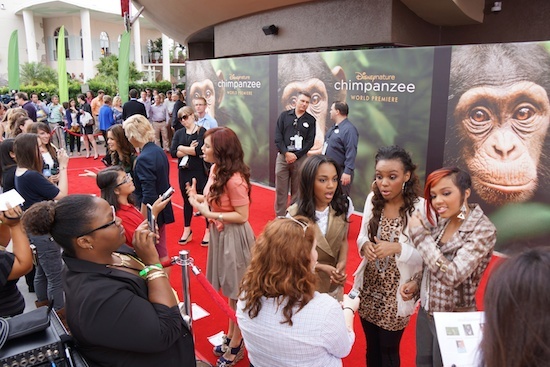 The red carpet event was attended by Dr. Jane Goodall, directors and producers Alastair Fothergill and Mark Linfield, Executive Producer Don Hahn, Disney CEO Bob Iger and some Disney Channel stars. The world premiere was a first for Downtown Disney. The Disney Channel Stars in attendance were Bella Thorne, Zendaya, Debby Ryan, Laura Marano, Ross Lynch and the McClain Sisters. Joe Rohde, executive designer and vice president of Walt Disney Imagineering was also in attendance. The world premiere of Chimpanzee is part of the Disney Kids and Nature Celebration, which runs through tomorrow at Walt Disney World Resort. It recognizes, rewards and inspires lifelong conservation leadership. The celebration features a host of events, including a special Disney Worldwide Conservation Fund Awards Ceremony that honored five organizations for programs that connect kids to nature, and the Friends for Change Youth Summit. Chimpanzee is narrated by Tim Allen and tells the story of Oscar, a young chimpanzee whose life is caught on camera for the world to see. Oscar’s curiosity and love for discovery shows off the intelligence of primates. Working together, Oscar’s chimpanzee family including his mom, Isha, and the group’s leader, Freddy, navigate the forest. When Oscar’s family is confronted by a rival band of chimpanzees, he is left to fend for himself until a surprising ally steps in and saves his life. It is yet another solid addition to the Disneynature film series. Here is the movie’s trailer. Look for our full review on this website on April 18. Chimpanzee swings into theaters on April 20, 2012, just days before Earth Day 2012. The film is rated G.